Amasty introduces its new module – Push Notifications for Magento 2 – that allows Magento merchants to build stronger and beneficial relations with their customers. 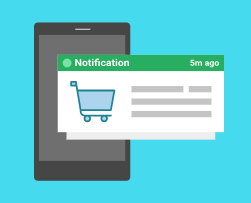 Push Notifications is a comprehensive solution for sending targeted notifications directly to web store visitors on any device they are using. Comparing to email reminders, push notifications is a much more efficient communication channel that leads to higher click-through rates and traffic. 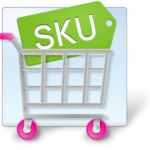 With the tool, store owners can set the popups displayed on a browser according to their goals, whether to inform online shoppers about ongoing sales, recover abandoned cart, or deliver any other custom message. In this way, it becomes easier to keep customers engaged, strengthen communication with them, and, as a result, boost your profit. Detailed statistics and reports on notifications performance. One of the benefits you get after installation of Push Notifications is that customers can receive notifications without visiting your website. With this feature, your clients will always get your message about a new offer, ongoing sale, or special event. 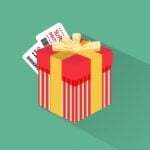 Besides, the extension uses opt-in forms to collect visitors’ consents on receiving notifications, so that you can show personalized messages only to target customers. Moreover, push notifications are sent directly to a customer via desktop or mobile device, reaching your target audience immediately with less chance of being ignored. You can use the module for creating different types of notifications and delivering any information regarding your new products, discounts, important alerts and updates, and more. The Push Notifications extension takes into account a user’s location, making it possible to generate targeted messages depending on a subscriber’s country. Besides, you can notify online shoppers about special events at your store, like the introduction of a new payment method or availability of out of stock items. Also, you can use the extension to deliver practical information to clients, for example, life hacks on using the products you sell. 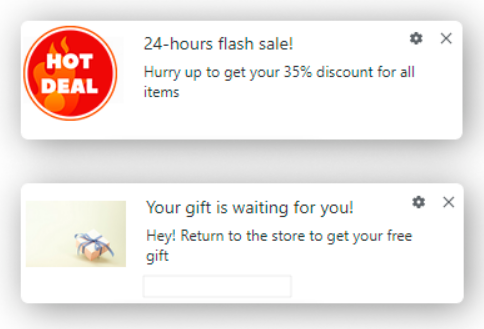 Of course, you can also create encouraging and motivating messages about your discounts, special offers, and different opportunities from which your customers will get some benefits, or any other unique notification corresponding to your business goals. Note that you can customize the design of your notifications, including the title, text body, and logos, as you wish to create more eye-catching messages. 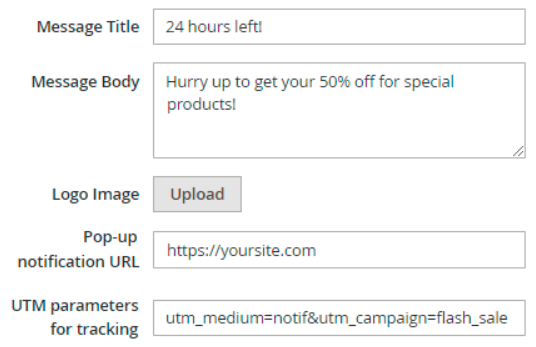 Besides, you can add a URL link to forward visitors to a relevant store page and include UTM parameters for tracking purposes. Also, you get full control over the display of prompts offering a subscription to notifications. With the module, you can create the design of prompt popups and manage with what frequency and on which pages to show them. 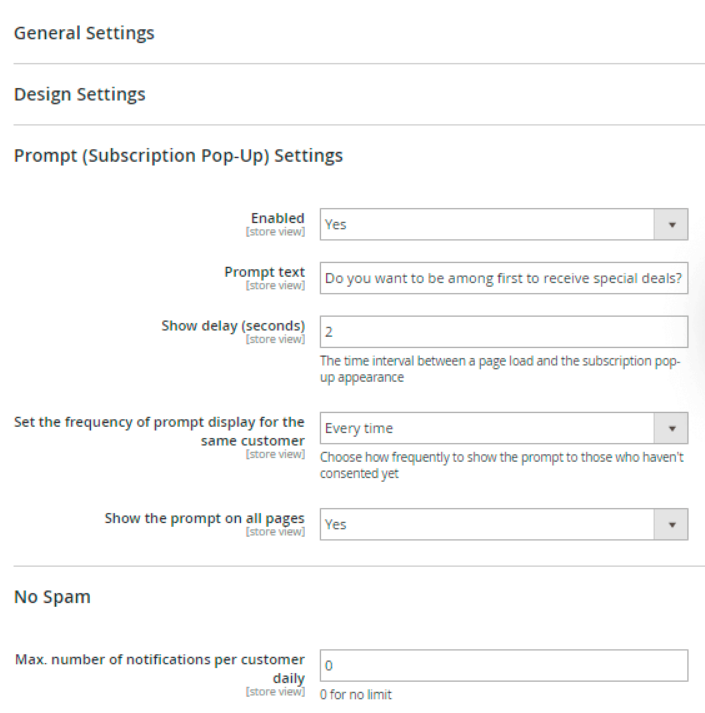 Settings can be configured for each prompt type separately: site-wide, back in stock, and order status prompts. Segmentation function allows dividing customers into different groups based on their location, date of the subscription, or other parameters. Using this possibility, you will be able to send highly targeted notifications to the users from a specific group. Besides, you can send notifications based on different triggers, like a product is back to stock, a customer abandoned the cart, or an order was updated. 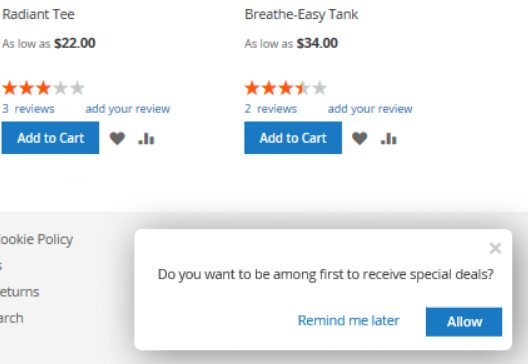 For example, you can show a triggered notification to customers who added some items to their cart informing that a product they are interested in is on sale. As an admin user, with the Magento 2 Push Notifications extension, you get flexible settings enabling you to create an unlimited number of custom campaigns. 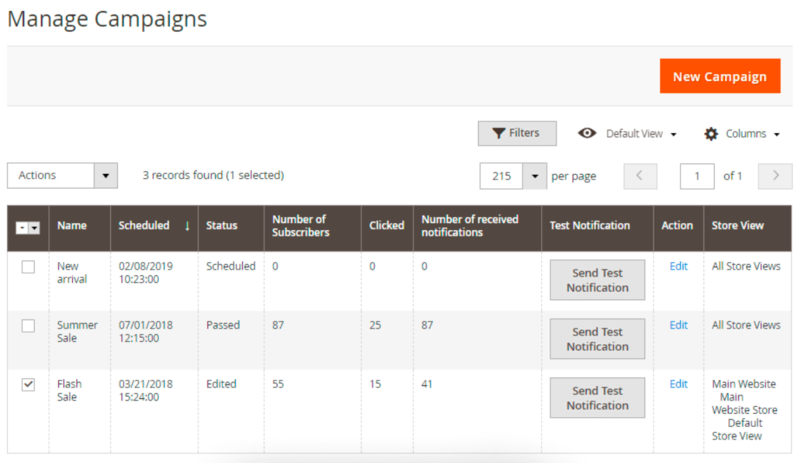 The module lets admins set the schedule for sending notifications, specify their frequency and duration, test how notifications work, and more. 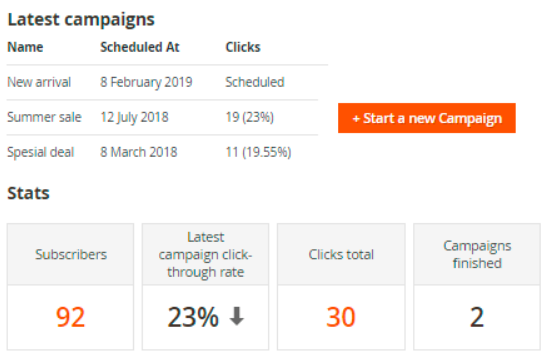 The campaigns grid also allows admin users to view the statistics on the number of clicks and notifications received by customers for each campaign. Total number of finished campaigns. With еру statistical data and structured reports generated by Magento 2 Push Notifications, you can easily see what should be improved to get even better results. In-depth data analysis performed by the module allows you to understand your subscribers’ behavior and interests so that you can provide customers with an exceptional attitude and build stronger relations with them. Magento 2 Push Notifications by Amasty is an advanced tool that allows establishing long-term and effective communication with customers and always keeping them informed about important events and opportunities. Push notifications can be used to provide your web store visitors with personalized offers, promotions, discounts, and any other information that will motivate them to come back to your website and convert into loyal customers. In comparison to follow-up emails, the chances are your notifications get noticed and read by the customers are much higher. According to some researches, websites that implement push notifications show the increase in average subscription and click-through rates at least at 10%. The extension’s flexible and user-friendly backend configuration lets store owners concentrate on their marketing efforts and quickly build campaigns adjusted to specific ecommerce goals.